I immediately opened it, was impressed from the four inner boxes and the instruction. The parts in the bags were mostly sorted so I could start building immediately. I started with the outer parts of the ship. It took most of the big plates. With that three days of building fun started. You had to do some parts twice, four times or even 32 times, but it was absolutely not repetitive. Building was a lot of fun. And the complete modul parts looked very impressive. But then, at day 4 I tried to connect all the parts. It was so unstable! I never managed to connect the lower outer parts to the body. It smashed at several parts, the magnets did not hold it at all. It was no fun anymore! Then the bridge parts. They were unstable as well. While trying to connect the lower bridge part with the upper part it smashed and hit two of my most worthful minifigs. They are broken now. Finally, somehow I managed to keep it together. It still stood at the floor, so I wanted to carry it to a shelf. Arriving at the shelf it was broken again. Thanks for the review Andi! But you can ask my parents and my friend what difficulties I had and how many screams and yells came out of my room today. Here are some photos from the building process. I did not make photos from the crashs, I was too angry, annoyed and such things. For moving it from one place to another, I'd suggest stripping it to it's frame and putting the other parts back on when you put it down. That's what I did. Also, I had no problem with stability, but the beams did bend after a while and the magnets didn't hold the hull together anymore. I'm sure there are some solutions to this though. Cool thanks for the review. I don't think I'm going to be getting this set anymore. Atleast not until I can figure out ways of making it sturdier. It is not difficult to modify this set to make it sturdier. I added some more support beams inside and a few more magnets and mine has been on display for over a year with no sagging. I can even swoosh it around if I want to. 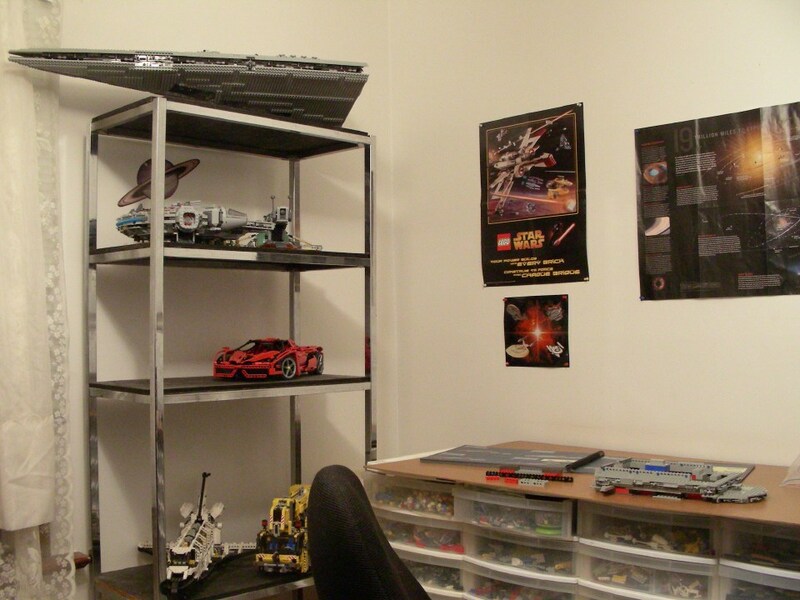 Judging by the pics it the UCS sd has a similar build style to the 6211 sd. Starting with that internal triangle. Not sure why you had trouble with this, it looks simple to put together. Maybe you missed some parts during construction. I don't know. The magnets look as though they are suppose to hold other sections to it. There are instructions on brickshelf showing how to mod the nose section to avoid the sag. Don't fret andi, with a bit of modding you could make it really solid. Don't fret andi, with a bit of modding you could make it really solid. No thanks, I have closed with that set. It's already at Ebay. I stick with the smaller one. But Voice of Reason would you tell us your secrets, and maybe even show some photos how you modded it? It could help others to keep the disappointment smaller or even totally away. Do a search on brickshelf they are there. I have seen them. I think this set is getting a bad wrap with all these reports of instability etc. Mine's also been on display for over a year. The only problem I've ever had with it was caused by a high velocity feline knocking one of the underside panels loose. Easiest fix I've ever had to do. Just lift the panel back into place and snap, the magnets do the rest. I have nothing but love for TLG, but just makes me wonder if their quality control might have a tad to do with some of your experience perhaps? Only saying this because out of the last couple of 2007 SW sets I've bought, I've had to already call Lego Customer Service to have parts replaced because I'd end up getting two identical pieces instead of two alternating pieces (i.e. two left wing pieces instead of left and right). Anyways, sorry that you were one of the few that had a negative experience with this otherwise excellent set! Detail: 10/10- it's a UCS. what did you expect? Playability: 2/10- get creative. find a bunch of minis, and have a giant war around it. or have it act as a flagship. Price to parts: 6/10- I didn't get some of the required parts, but they were easily found. I'm very satisfied with my Destroyer. I'm still showing it off to my friends and family I should have pics up soon. I am part way through the build and so far really enjoying it. I am following the proper sequence as per the instructions. So the structural skeleton was built first, then the rear with the engines, then the two larger lower panels. Everything went together perfectly so far. Can't wait to get back to building more of it. (Because of time committments I'll have to spread it over the evenings all week, a couple hours here a couple hours there...). I just finished building this in two marathon sittings the last two nights. All I can say is, "Wow!" This baby is absolutely stunning. Even the pictures, which looked cool, didn't do it justice. This is just something that needs to be beheld to be believed. My main problem now is finding a place to display it. As stated, you start of building the triangular frame first. The one thing I didn't realize until later is that you actually build the same frame twice, and then flip one over to attach it. It might have been easier to build them simultaneously, rather than one after another, but what are you going to do? This part was actually pretty enjoyable except for the part where you have to essentially build the same part 32 times (16 for each triangle). Granted, these are the greebled pieces that run around the outside perimeter, so its time well spent. It just got a little repetitious, that's all. Next came the rear panel and the 4 other panels (2 on bottom, 2 on top). These were pretty simple and straightforward. My only snag came when I realized my instructions were missing a page. Fortunately, I was able to look forward to the mirror image for the other side and reverse-engineer it for the side I was working on. It sounds complicated, but it was actually fairly simple. The thing people need to remember here is that the magnets are NOT the primary means of holding these on. 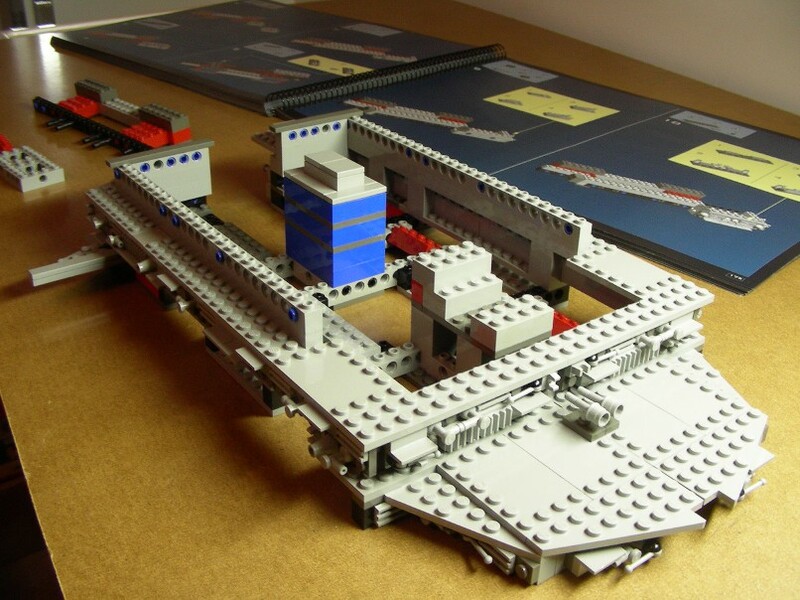 They used the same type of method they did with the 6211 with bricks attached to technic rods to connect the panels along the outer edge. The magnets then hold the piece in place along the centerline. Finally we came to the two pieces that would form the bridge (and the area below it). This was probably my favorite part. They used lots of those square technic bricks in new and interesting ways. Plus, there was lots of symmetry (which I love) which makes things easy to build. As usual, the greebled pieces tend to slow you down, but the end result looks so great that its hard to fault them for it. Plus, if they didn't include them, it would probably just look like a gray piece of crap, so I played along. I did find it a little odd that these pieces didn't actually connect to the main chassis, but simply sat on top of it. This does, however, make it easy to remove them for fixes or to move it around (Just reach inside and grab it by the frame). The only other UCS I've built so far is the Death Star, and the two are definately comparable in size and price. However, having now built and seen both, I have to agree with others when they say that the Star Destroyer just stomps the ever-loving crap out of the Death Star. I mean, I love the Death Star too, but when it comes down to sheer scale and awesomeness, the Star Destroyer just owns. After I was done, I really couldn't keep my eyes off of it. I kind of felt like a pervert who can't stop eyeing up the mannequins at Victoria's Secret. You'd think that something that was entirely gray would be boring to look at, but you'd be thinking wrong. Every time I look at it, I notice some subtle new detail that just makes me marvel at LEGO's enginuity (which I was doing the whole time I was building it). At $200, this baby was a bargain. For those of you still on the fence about it: Get off the fence and go order it already!! At this price, you can't afford not to. I'm currently re-assembling mine after having parted it for Captital SHIP mocs. Still a great build. Still a great display...for the Lego room. Large grey wedges do nothing for a living room. I got this set this last summer. Was quite a fun build. It went together really well and the instructions were pretty clear (still had problems figuring out if that little piece was black or just dark grey...). Only irk I had was that on the top panels, they didn't seem to fit together as well as they should have. Great set for $200 though. It's now disassembled into a parts bin. Miraculously mine is still put together. I took it down from the top shelf and dusted it off the other day and remembered how unstable the base on it is. When I get time I'd like to tinker with it and see if I can't make the base more stable and the interior more usable. Other than that it is still one of my favorite sets. After all it is a gorram star destroyer. I'm taking my time so I thought I'd post a couple pics. I hope they're not too big. I had to store the main body in it's display location because it's so big and it took up too much of my already huge building surface. I just finished building this in two marathon sittings the last two nights. When I built mine I started on a sunday, spent most of the day on it, then because of work I had only evenings after that so I spent 2-3 hours a night from Mon-wed/thur. I think in all, I probably had somewhere in the range of 17-20 hours to build it to completion. Now here's the funny part. I took it apart recently to put it away and it must've taken me 3 HOURS just disassembling and sorting in order to store it away.